There are multiple ways to do just about anything in Adobe RoboHelp. For instance, if you're looking to generate a layout, you can elect to use the Single Source Layouts pod, use a keyboard shortcut (Ctrl-m) or select the Generate menu item found in the File menu. During a recent RoboHelp class, I asked everyone to generate using the File menu (File > Generate). One of my students told me that he would be happy to do so, but the Generate menu item simply wasn't available in his File menu. It's not that I didn't believe him, but after taking a look at his File menu, I confirmed that his Generate menu item was, in fact, missing. We tried resetting his Workspace (Environment in RoboHelp 8), but the pesky menu item would not reappear. The student told me that he had never intentionally removed any of the menu items, and I believed him. Of course, that would mean that the menu item simply decided that it no longer wanted to be accessible. While strange, this is not the first time I have seen this kind of bad behavior in RoboHelp. Fortunately, the fix is simple. Choose View > Toolbars > Customize. 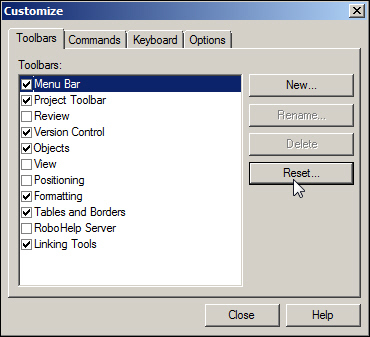 On the Toolbars tab, select the Menu Bar toolbar and then click the Reset button. Click OK when you see the alert dialog box asking you to confirm your action. While you will need to repeat the steps for any Toolbar that is missing a menu item, it just takes seconds and works every time. Looking to learn RoboHelp, and fast? I teach a live, online class that will give you the most essential RoboHelp skills... and in just two days. Thank you for this lifesaver! The Generate option from my File menu just disappeared overnight from my Robohelp 9 installation, after 7 months of use. Many thanks for sharing this inforation, Kevin. I thought I was seeing things when the View and Generate options just dropped off the File menu without warning - absolutely bizarre. They're back now, thanks to this posting. I'll remember the fix should it happen again. Much appreciated!